Get the latest on specials and events. Be the first to meet our new cottages! THIS PROPERTY RENTS SATURDAYS-SATURDAYS JUNE - SEPTEMBER. 7-NIGHT MINIMUM REQUIRED. Off-Season Arrival and Departure dates may be flexible. A treasured Maine cottage at the edge of the Atlantic Ocean on Southport Island is waiting for you to settle in for a memorable Maine vacation. Here, it is all about the ocean. This could be your vacation spot, the one you will come back to year after year! Wake up and go to bed in your little slice of heaven. Feel the pounding of the surf come up through the ledge on which you stand taking it all in. The Ledge will surely excite your senses! THE HOUSE: This charming, single-level summer cottage is as good as it gets. The sitting area with the big bay windows and waterside deck afford views of Cuckholds Lighthouse, boat activity and birds. Both of the open decks have comfortable deck furniture for relaxing and dining. The large manicured yard is another perfect hangout for the family. The cottage boasts a gourmet kitchen with custom cabinets and is artfully decorated throughout. Big windows accentuate just how close you are to open ocean. Talk about waterfront! The first bedroom has one Single bed, the second bedroom has one Single bed. A 3/4 bathroom with shower is closest to these bedrooms. The Master Bedroom contains one Queen bed and en-suite full bathroom. PETS PERMITTED? Sorry, no pets allowed. LINENS & TOWELS INCLUDED? Yes, linens and towels are provided for your stay at no additional cost. Guest of The Ledge will enjoy the little pebble beach, great for sunning or tide pool exploring at low tide. Swimming, kayaking and sailing are all doable from the beach. The large yard is great for badminton and croquet, Frisbees or kite flying. Southport Island is great for biking and walking. The Yacht club is a short drive away as is the championship golf course. Be sure to bring your binoculars as you will love all the scenery; light houses, birds, porpoise, seals and even whales have been seen from this part of Southport. Sail boat, yachts and the occasional tall ship pass by as well! The cottage is only a short drive to dining, shopping, boat trips, hiking trails, and more in and around the Boothbay Harbor Region. You'll be less than a mile from the Newagen Inn and just a couple of miles across the Island from the Southport General Store. Southport Island is a hidden treasure on the Boothbay Peninsula. Two miles from Boothbay Harbor, you cross the bridge onto the island and feel the world change around you. Rent kayaks locally or bring your own and launch them from right the property. Nearby you will find hiking trails, biking, the Southport Historical Society Museum and Southport Beach with views of Hendrick’s Head Lighthouse. Visit the Southport Memorial Library to check out the famous Ruby Slippers and learn about their connection to the area. While you are there, borrow a Rachel Carson book and explore some of her favorite spots on the island. Farmers markets and food stands are THE spot to buy fresh and local. Don't forget the seafood! Lobster abounds in this area and can be purchased at the many lobster pounds on the island, including Robinson's Wharf and Oliver's Restaurant. The Southport General Store is known for its breakfast pizza and sandwiches and extensive wine collection and gift barn. The Boothbay Peninsula is a beautiful region rich in culture, history, all things nautical and of course it’s own unique niche in nature. The area offers ample opportunities for biking, kayaking, canoeing, fishing, charters and guided cruises, spas, golf, mini-golf, bowling, museums, antiquing, hiking and walking trails. We have the Maine State Aquarium, the Coastal Maine Botanical Gardens and the Boothbay Region Land Trust with its 30+ miles of pet friendly trails in protected areas. Needless to say you'll want to come back again and again! They are friends. We truly enjoy seeing them each year. They are genuinely kind and considerate. We hope to stay with Cottage Connection at the Ledge for many years to come. We love the people and the property. The staff are excellent! They are very kind, friendly and responsive. We consider them to be friends. We enjoy our stays so much that we have returned for years. The property is perfect for us! A 4-NIGHT MINIMUM IS REQUIRED FOR NON-PEAK SEASON RENTALS. We require at least 72 hours’ notice of intent to rent so the cottage can be prepared for your stay. Final confirmation and Check-In information will be e-mailed to the guest TWO WEEKS prior to their scheduled arrival. Swimming Area Rating 4/5:Easy water access, may be a pebble beach or grassy shoreline. Still good for all ages, but young children may want water shoes. Privacy Rating 4/5: Private location, protection from trees, neighbors a comfortable distance away, not close to any roads. SMOKING AND/OR FIREWORKS ARE PROHIBITED ON EVERY PROPERTY MANAGED BY CCM, INC.
We represent a wide variety of quality vacation rentals throughout the Mid Coast Region of Maine. Individually and privately owned, each vacation rental reflects the taste of its property owners. Every effort has been made to ensure that the descriptions and amenities listed above are accurate. However, occasionally changes are made to furnishings, amenities, and equipment made by the owners. Once a change is brought to our attention, we will update that webpage. If you have any specific questions not addressed above or are in search of specific criteria, please contact us. 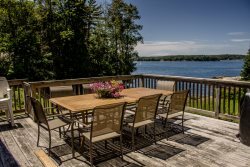 WHY BOOK WITH COTTAGE CONNECTION? Vacation Rentals. Privately Owned. Professionally Managed. Trusted since 1993. Cottage Connection was one of the first vacation rental companies in the Mid-coast region of Maine. Since being created by Jeff and Audrey Miller in 1993, Cottage Connection has been trusted by homeowners and vacationers alike to “connect” each family with the perfect vacation cottage. As Audrey puts it; “The home they stay in becomes a personality, a part of their lore, when a family connects with the right cottage. Whether they want a rustic cabin in the woods or a high-end ocean bungalow, the right setting sets the tone for the entire vacation."